I made my way toward the Dolomites but decided to stop for a couple of days in the medieval city of Bologna. It’s a difficult city to get a feel for — it’s at once the rarefied city of scribes and scholars and a thoroughly modern, technologically advanced metropolis. What drew me in, however, was the city’s medieval center, the winding, terra cotta heart of the city. December 2016, panorama from 3 vertical images, additional exposures for highlights, focal length 16mm, aperture f/8, shutter speed 8 seconds, ISO 100, tripod. Much of Bologna was destroyed during World War II, but the historic part of the city survived. This part of the city, built when Bologna was at the peak of its power and wealth, was once dotted with towers. 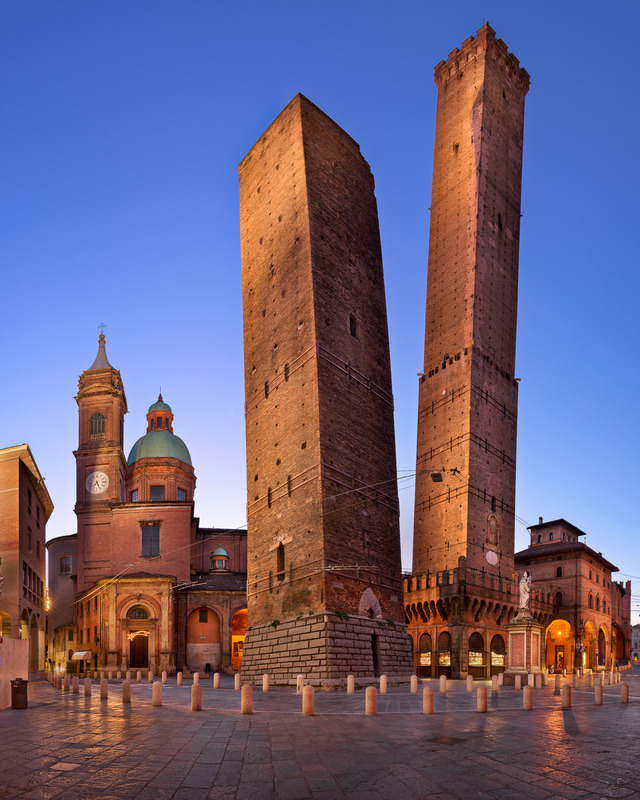 In fact, one of Bologna’s many affectionate nicknames is “la turrita,” or the “city of many towers.” There were once hundreds of towers in the city; some were built for defensive purposes and many others built by powerful families, continually attempting to one-up each other. Most of the towers long ago crumbled into history. But among the ones that still stand, perhaps the most well-known are Asinelli and Garisenda, the city’s “Two Towers.” They’re not as famous as their counterpart in Pisa, but perhaps more interesting: Asinelli is taller and Garisenda has more of a lean. Echoing their long history — they’re also older than the Leaning Tower of Pisa — is an inscription on one of Garisenda’s slopes from Dante’s Divine Comedy that mentions that exact tower. The Two Towers are so tall and so intimately positioned with one another that it was difficult to capture them together in a shot. I used a panoramic technique to get them both in the frame as the sun rose over Bologna. They seem to me to be two old, time-tested friends: the sturdy and solid Asinelli and the whimsical, free-spirited Garisenda, eternally looking askance at the old city.